One of the most common gripes I hear is that the finderscope supplied with the telescope is not very easy to use, most commonly this dissatisfaction is with the red-dot finders, which a number of people find difficult to use. I will also add that a number of experieced astronomers swear by them, but having said this these astronomers often use a combination of two types of finders to locate their object, using the red-dot finder for the initial targeting, and then a another to home in on the object. There are a number of choices when you want to change your finder-scope, first of all you need to get one that will fit your scope and also one that can be attached and detached easily. Sometimes, with some telescopes such as Sky Watcher you have a standard fitting so that the new finder can easily fit into the 'shoe' you already have fitted to the telescope. This makes life easy, of course. Finderscopes come in different magnifications and my advice is to always go for the larger. Two common sizes are 6 x 30 and 9x 50, the latter being the better if your budget will allow, they both have cross-hairs to accurately target your object. If you already have one of these, you can improve on this and get a 'right-angled and right-way-up side corrected finderscope' like the one in the illustration opposite which greatly improves your comfort when viewing and will save time if like me you always nudge the scope in the wrong direction because the view through a reflector telescope for example is back-to-front and upside down, it makes life so much easier! 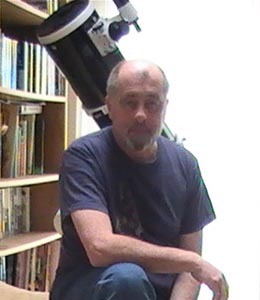 You will often find that different makes have a standard fitting, so you can, for example, fit an Orion finderscope to a Sky Watcher telescope (as I have done), but always check with the retailer first. Compact design lets you use both eyes. Aiming your telescope is easy with its wide-open right-side-up view. Projects 1/2 and 2 degree red circles onto the night sky - what you see in the red circles is what you get in your telescope. 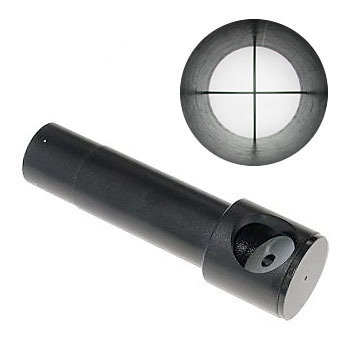 Pulsed or continuous illumination of the reticle is a standard feature on the QuikFinder. Includes two baseplates, one for apertures around 5", the other for larger apertures. Easy clip on/off mounting to baseplate (no screws to fumble with). Other Features: Rugged construction, an ultra-efficient LED and lithium battery (included) for long life. QuikFinder attaches without drilling and is easily removed from its baseplate for storage. Additional baseplates are available for using QuikFinder on more than one telescope. The Telrad can be employed as the sole or primary sight of a telescope to help you "star hop" using visible stars to find and center objects that would be invisible to the naked eye or in other small finder telescopes. Or, you may choose to use a Telrad in combination with a second conventional magnifying finder telescope. 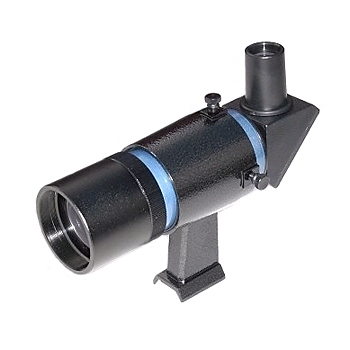 The Telrad is the innovative, dominant choice of finder sights by the amateur astronomy community, and it is not uncommon to find a Telrad on professional observatory telescopes too! It is a particular favorite among experienced amateurs using deep sky telescopes (particularly larger "Dobson" style telescopes) where aperture and the ability to find faint deep sky objects are concerns. . 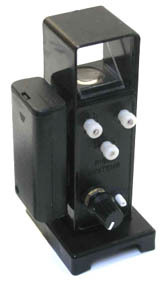 The Telrad is often the choice to replace economical finders sights provided on telescopes. This finder is often the most commonly desired finderscope. Notes on using a Telrad can be found HERE and also HERE! Another upgrade that is frequently considered is an upgrade on the focuser of your telescope, upgrades can be done on Newtonians or refractors, the only disadvantage is sometimes the prohibitive cost of the upgrade, but well worthwhile, as a standard rack-and-pinion focuser is often unsatisfactory for fine adjustment and especially so for astro-photography. 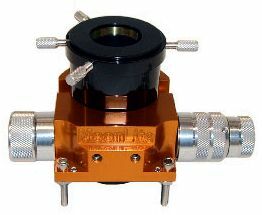 The example opposite is one of many on the market, this is dual-speed focuser for a Newtonian telescope with a compression ring eyepiece clamp. The beauty of an upgrade like this is the smooth fine adjustments that can be made, but this comes at cost. Equally, upgrades can be obtained for refractor telescopes of similar quality and price! Please note that prices for various upgrades vary greatly, but all tend to be expensive! Dual-speed Crayfords seem to be the most commonly desired upgrade and can greatly add to your enjoyment of astronomy, especially if you are a deep-sky observer. Always discuss an upgrade like this with the retailer to ensure you get the right upgrade for your type of telescope. Many new premium grade telescopes now come with these as standard. 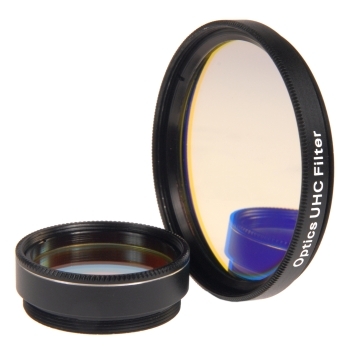 If you only get one filter this is the one to buy as it suits all telescope apertures, the UHC has good transmission and can be used in any aperture. The UHC filter permits superb views of objects like the Orion, Lagoon, Swan and other extended nebulae. It performs well in smaller aperture instruments owing to its greater light transmission than the O-III, yet still suppresses light pollution well. The UHC filter is the best all-round dark-sky nebula filter. 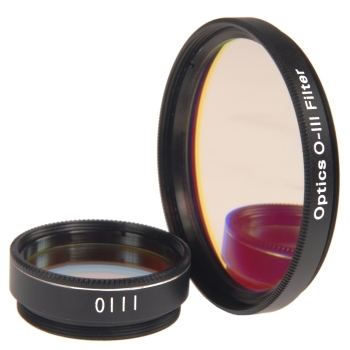 O-III filters are suited to telescopes with of any aperture 90mm and above and can produce near-photographic views of the Veil, Ring, Dumbbell, Orion and many other nebulae in larger apertures. This is a suitable upgrade from a standard ND96 Moon filter, though it would not and should not replace it altogether, as it is important to have a Moon filter that has a standard one-off density that you can rely on and place in your eyepiece quickly. However, many amatuer astronomers say the 'variable' is the best thing since sliced bread and it is therefore worth looking at this clever little filter. 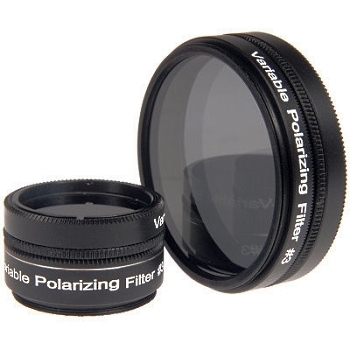 This variable polarizing filter made from anodized aluminium and optical glass allows you to progressively reduce the amount of light entering your eyepiece. Reduces glare whilst increasing contrast so perfect for observing bright objects such as the Moon or certain planets. Light transmission can be varied from 40% down to as little as 1%. Will not change the colour of the object being viewed. Prevents eye fatigue and loss of night vision. Each filter set consists of two polarizing filters, one which can be rotated in its cell to adjust the brightness. The filters, used as single elements, can also be used for daytime terrestrial use for reducing sunlight glare from lakes oceans or window glass. Available in two sizes, threaded to fit either standard 1.25 or 2 astronomical eyepieces. A collimating eyepiece is essential, and not just an accesory, if you own a reflector telescope. The reason is that the primary and secondary mirrors need aligning from time to time and a collimating eyepiece allows you to correct the angle of the mirrors. 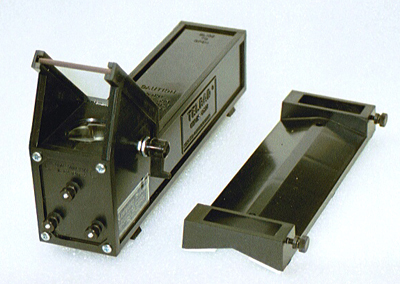 There are several types available, the main two are the manual (Cheshire) collimater, reviewed here, and the laser collimator. This collimating eyepiece is a combination of a sighting tube and Cheshire eyepiece. The sighting tubes narrow field of view and crosshairs provide a centering reference for the telescopes optical elements. The Cheshire eyepiece has a means of providing illumination to a target face (set at 45 degrees to the illuminating hole) that will be used to collimate the primary mirror. See Links Page for tutorials on collimation. In summary, if you can, always talk to other amatuer astronomers about thier experiences, you can learn a lot from talking to other people, or join the Stargazers Lounge, a huge resource of information! There are a number of ways you can improve your stargazing experience either by uprading your original telescope eyepieces or by buying accessories that improve or aid better viewing of the night sky. Just one or two simple measures can sometimes make a lot of difference. This page offers a few ideas on how to upgrade and improve on what you already have. By way of introduction the most common upgrade is eyepieces, and that is dealt with on a separate page, so here we will concentrate on other ways to assist you in your stargazing.